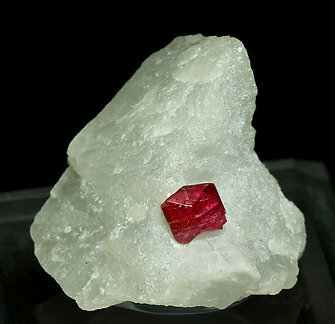 The Myanmar Spinels are well known for their quality, color and transparency. We buy quite a few and from time to time we come across the rare cases where the Spinel is a twin. This is the case here, but this time the twin is more complex (crystallographically speaking) than the other ones we see. Unusual. 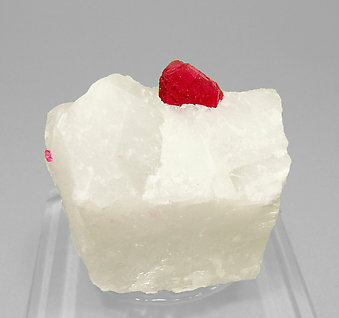 The Myanmar Spinels are well known for their quality, color and transparency. We buy quite a few and from time to time we come across the rare cases where the Spinel is a twin. In this case the twin is very clear and its form very well defined. 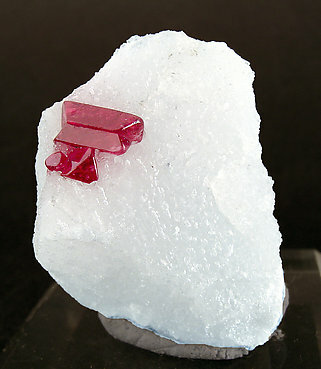 The color is also magnificent and it is accompanied by other un-twinned Spinel crystals that are also of a good color. Single crystal neatly twinned on the law typical for the species. 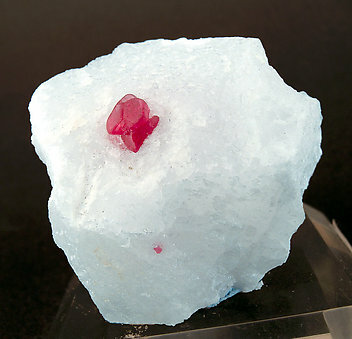 It is implanted on a white Calcite matrix, is transparent and has an especially intense and uniform red color. A miniature very representative of the species. Very transparent and bright isolated crystal on Calcite matrix. It has an extraordinary red color and a very obvious twin, typical for the species.